Geneva, 8 March 2018 - “A world free from fear and from violence, where no one is left behind, is the ambitious vision of the 2030 Agenda for Sustainable Development,” recalled SRSG-VAC Marta Santos Pais in her Annual Report to the 37th session of the Human Rights Council (February-March 2018). Agenda 2030 recognizes the crucial role played by early childhood development in creating peaceful, prosperous societies, giving important impetus to realizing the rights of every child to grow up in a safe, nurturing environment through SDG Target 16.2: to end all forms of violence against children, and SDG Target 4.2: to ensure children have access to quality early childhood development. This is why violence prevention must start in early childhood! It helps provide children the opportunity to fulfil their potential, pursue opportunities and participate fully in society as active citizens and agents of change, thereby helping to advance progress in achieving SDG targets 16.2 and 4.2. “Investment in early childhood may cost as little as $0.50 per child per year when combined with other services. But when this opportunity is missed, countries may forfeit as much as two times their current expenditures of GDP on health and education,” added SRSG Santos Pais. Santos Pais’ annual report also highlights several other key areas of progress achieved in 2017 to strengthen children’s freedom from violence and accelerate progress towards the SDG 16.2 target of zero violence against children by 2030. 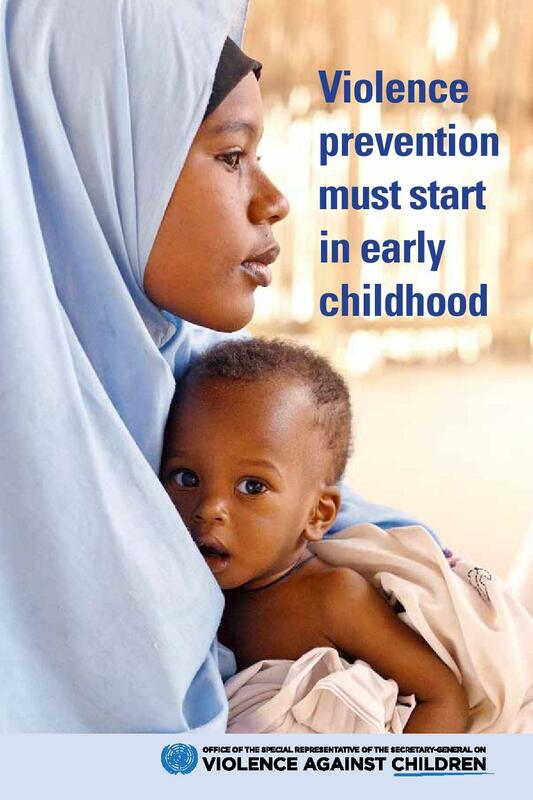 These include major initiatives aimed at sustaining and scaling up efforts to ensure children’s protection from violence at the global and regional levels – especially through the adoption of Regional Plans to prevent and respond to violence against children - as well as through strategic national implementation efforts. · National legislation to ban all forms of violence against children and protect child victims gained new ground across regions, including Mongolia, Lao People’s Democratic Republic, Vietnam, Lithuania, Slovenia, Ireland, Benin, Paraguay and Peru, bringing the number of countries with a comprehensive legal ban to over 50. · El Salvador, Honduras and Trinidad and Tobago raised the minimum age of marriage to 18, while Jordan, Tunisia and Lebanon made important progress in legislation aimed at ending impunity for sexual offences against children, through their repeal of legal provisions allowing rapists to avoid prosecution by marrying their victims. In her report, SRSG-VAC Santos Pais also highlights two priority issues for millions of children around the world: the protection from neglect, abuse and exploitation of migrant and refugee children on the move; and, children’s freedom from bullying.